Ohio State vaults to No. 2 in the BCS computer rankings after topping Michigan and watching Alabama fall by the wayside. Auburn is up to No. 3 in the computers and No. 3 in the BCS. 1 Florida St. Florida St. Auburn Ohio St. Florida St. Florida St.
2 Ohio St. Ohio St. Ohio St. Florida St. N. Illinois Ohio St.
6 Arizona St. Stanford Stanford Arizona St. Auburn Arizona St.
With the drama seemingly run dry in the previous two weeks, the next to last BCS rankings of the season holds few surprises — but there’s plenty to be found if you look close enough. That simple equation we’ve been talking about — Notre Dame and the SEC champion for the BCS title game — is all but written in stone. With Notre Dame’s season-ending victory over USC, the Fighting Irish land at No. 1 in this week’s BCS rankings, and will land there again next weekend. No. 2 Alabama and No. 3 Georgia will play in a de facto national semifinal game in the SEC Championship. Florida lands in the No. 4 spot just behind Georgia. But fret not Bulldog and Crimson Tide faithful, win the SEC and you’re in — much like it’s been these last few years. Further down, No. 5 Oregon and No. 6 Kansas State lead a group of small changes in the BCS’s top 10 this weekend, as what was expected after a rivalry weekend full of ranked matchups whittled the field down. So pretty bland at the top. But little further down the intrigue for yet another non-AQ BCS buster bid is in store. Three teams — No. 17 Kent State, No. 20 Boise State and No. 21 Northern Illinois — are all within striking distance of the top 16. A spot inside the BCS’s top 16 will mean an automatic bid to a BCS this year, as the Big East’s champion will land outside the top 16, activating a clause in the BCS to include a deserving non-AQ team in the BCS process. Although none of the three are in the mix this weekend, Northern Illinois and Kent State are set to battle for the MAC title next weekend, the winner hoping to get associated BCS bump with a win over another ranked team. A Kent State win might give the Golden Flashes just enough to claim that elusive BCS bid. Northern Illinois will need some help if they are victorious. Boise State is doomed by its poor computer showing, and will likely not be able to crack the top 16. The ACC Championship Game will feature Florida State and Georgia Tech. The winner is headed for the Orange Bowl. The Big East will be decided Thursday when Louisville and Rutgers face off. The winner is guaranteed a BCS bowl bid. The Big Ten Championship Game will feature Nebraska and Wisconsin. The winner is headed for the Rose Bowl. The Big 12 will come down to Kansas State and Oklahoma. A Kansas State win over Texas gives the Wildcats the conference championship and a Fiesta Bowl bid. It also likely another Oklahoma win gives the Sooners at least an at-large spot. An Oklahoma win combined with a Kansas State loss gives Oklahoma a Fiesta Bowl bid with the conference title. The Pac-12 Championship Game will feature Stanford and UCLA. The winner is headed for the Rose Bowl. The SEC Championship Game will feature Georgia and Alabama. The winner is likely headed for the BCS title game. If Alabama wins, Florida is all but guaranteed a Sugar Bowl bid. If Georgia wins, either Alabama or Florida is likely Sugar Bowl bound. The MAC Championship game will feature Northern Illinois and Kent State. The winner could vie for a BCS bid, needing to finish in the top 16 to make a BCS bowl. As it stands, explore our projected BCS bowls. It all comes down to this final weekend. Though we can be pretty sure about a lot, there’s almost nothing guaranteed other than Notre Dame’s bid in the title game. 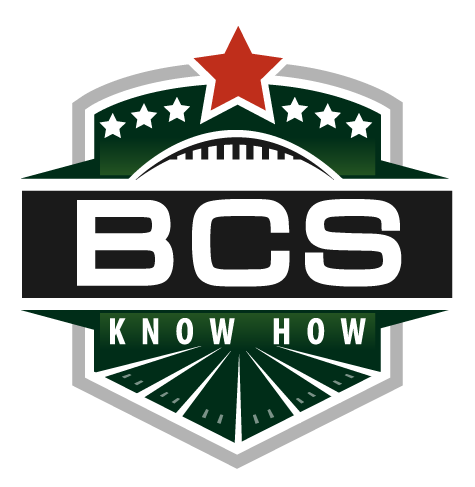 Be sure to stay tuned to BCS Know How and @BCSKnowHow throughout this final week for all the latest analysis and news. Less change than expected, certainly. After a weekend of classic BCS mid-November chaos, the tame holiday weekend we just saw might have left some wanting for more chaos. And although nothing we took in this weekend came anywhere close to providing the upheaval and strange combinations that losses from the top two teams in the BCS can provide, we certainly were able to answer some questions. That starts at the top, of course, as Notre Dame will bow at the top of the BCS standings both this week and next, and will be on its way to a national title game. That’s the luxury of ending your season a weekend early, and ending it with a nationally televised win over your traditional rival, in this case USC. After that it gets a bit funny, but nothing we can’t explain. Alabama again will occupy the No. 2 spot in tomorrow’s BCS rankings, awaiting its SEC title showdown with Georgia, which will slip one spot this weekend to No. 4. Why? Well, the Bulldogs’ win over a ACC title game-bound Georgia Tech squad will not prove the impact win they might want the weekend before the SEC title game. Florida will instead occupy that spot on the strength of the best out-of-conference victory of the weekend, and will slide into No. 3. But any fret that result may cause either Alabama or Georgia fans hoping the two teams are playing in a de facto national semifinal should be short-lived. 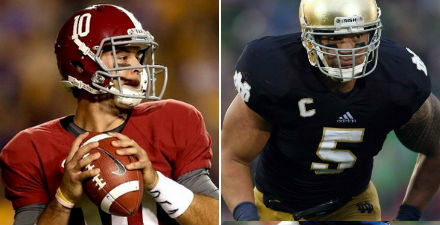 Whichever team wins the SEC will play the Fighting Irish in the BCS title game. You can be sure of it. After that, things will look pretty familiar. Stanford’s win over UCLA — setting up a rematch less than a week from now for the Pac-12 title — will prove more of a mover of votes that you might expect, and give the Cardinal a push past LSU for the No. 7 spot. Oklahoma and Nebraska will slide back into the top 12 after losses from Clemson and the Seminoles open up the way. But that’s the simple stuff. The things to keep an eye on? The non-AQ chase. With Boise State, Northern Illinois and Kent State angling for a spot in a BCS bowl, the possibility remains that any of the three could steal a BCS bid away from an AQ conference school with a finish in the top 16. Expect all three to land outside the top 16 this weekend. Next weekend, however, the BCS might just sneak in its fourth non-AQ team in five seasons. With the knowledge that Oklahoma State was set to make up ground in the computers after a victory over Oklahoma, Alabama faithful had to hope the damage wasn’t too severe. And it wasn’t. The Crimson Tide retained a .930 computer share, which was integral to them retaining the No. 2 spot in the final BCS standings. Oklahoma State’s .950 proved to just not be enough. 3 Alabama Alabama Alabama Alabama Oklahoma St. Oklahoma St.
5 Kansas St. Oregon Stanford Arkansas Kansas St. Kansas St.